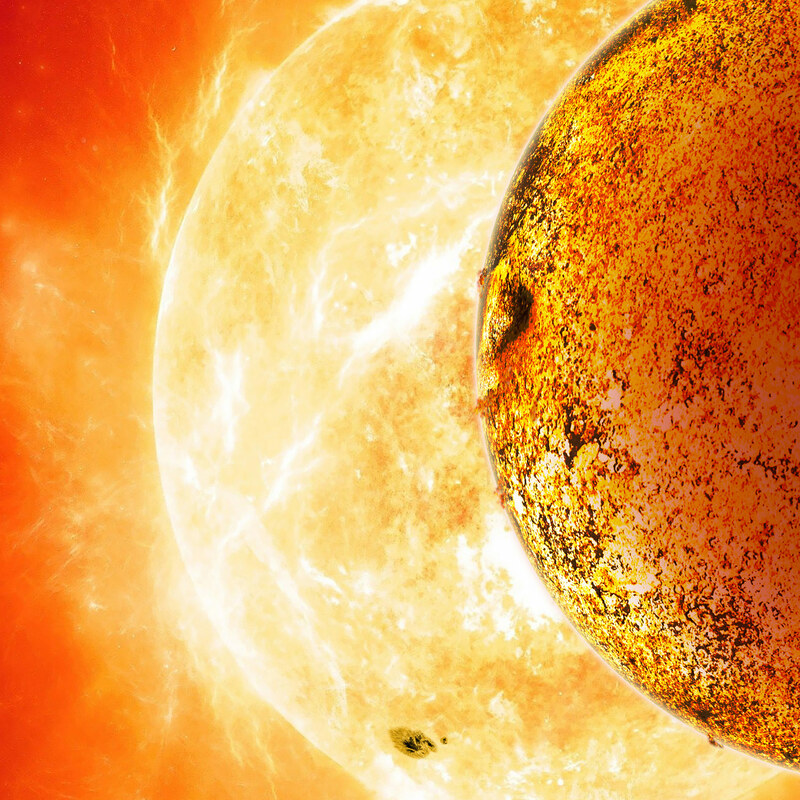 Astronomers discover the first known Earth-sized planet with an Earth-like density, a scorching lava world that circles its star every eight and a half hours at a distance of less than one million miles. Cambridge, Massachusetts – Kepler-78b is a planet that shouldn’t exist. This scorching lava world circles its star every eight and a half hours at a distance of less than one million miles – one of the tightest known orbits. According to current theories of planet formation, it couldn’t have formed so close to its star, nor could it have moved there. Not only is Kepler-78b a mystery world, it is the first known Earth-sized planet with an Earth-like density. Kepler-78b is about 20 percent larger than the Earth, with a diameter of 9,200 miles, and weighs almost twice as much. As a result it has a density similar to Earth’s, which suggests an Earth-like composition of iron and rock. The tight orbit of Kepler-78b poses a challenge to theorists. When this planetary system was forming, the young star was larger than it is now. As a result, the current orbit of Kepler-78b would have been inside the swollen star. “It couldn’t have formed in place because you can’t form a planet inside a star. It couldn’t have formed further out and migrated inward, because it would have migrated all the way into the star. This planet is an enigma,” explains Sasselov. According to Latham, Kepler-78b is a member of a new class of planets recently identified in data from NASA’s Kepler spacecraft. These newfound worlds all orbit their stars with periods of less than 12 hours. They’re also small, about the size of Earth. 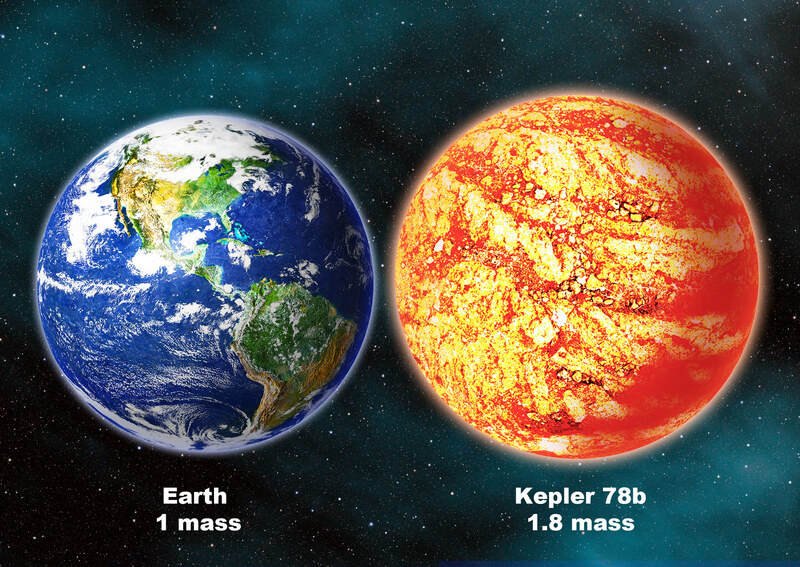 Kepler-78b is the first planet in the new class to have its mass measured. “Kepler-78b is the poster child for this new class of planets,” notes Latham. The team studied Kepler-78b using a newly commissioned, high-precision spectrograph known as HARPS-North, at the Roque de los Muchachos Observatory on La Palma. They coordinated their work with a second, independent team using the HIRES spectrograph at the Keck Observatory. The teams’ measurements agreed with each other, increasing their confidence in the result. Kepler-78b is a doomed world. Gravitational tides will draw it even closer to its star. Eventually it will move so close that the star’s gravity will rip the world apart. Theorists predict that Kepler-78b will vanish within three billion years. Interestingly, our solar system could have held a planet like Kepler-78b. If it had, the planet would have been destroyed long ago leaving no signs for astronomers today. Kepler-78b orbits a Sun-like G-type star located 400 light-years from Earth in the constellation Cygnus. 3 Comments on "Kepler-78b, A Lava World with an Earth-Like Density"
Kepler-78b is not where anyone thinks it ought to be. Ok, if one takes a walk on the wild side could it have been moved there? Is it possible to extract energy by changing the size of the orbit of a planetary body? If so could it be that some of these objects with truly bizarre orbits have been moved there as a result of some sort of engineering enterprise. I am sure this thought is a result of my ignorance of basic physics but can someone prove this wrong? It would be really interesting if it were possible. 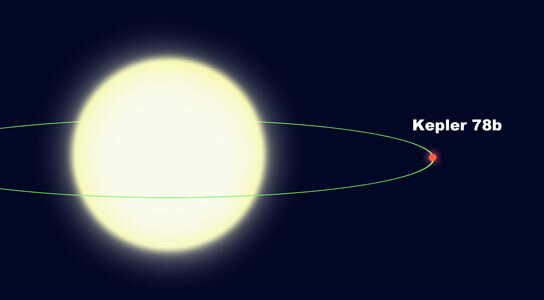 Kepler-78b in a very close orbit to its star is like our Mercury going around the Sun and gravitationally locked . 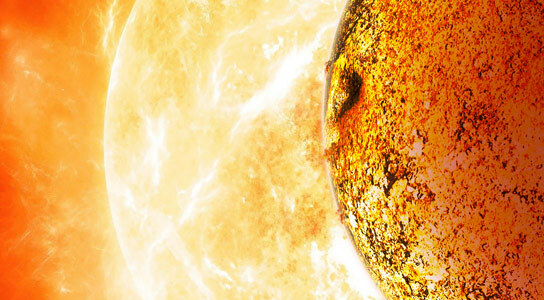 The fate of Mercury is already known to be eaten by our Sun. The fate of the Lava world also will be the same.Thank You.